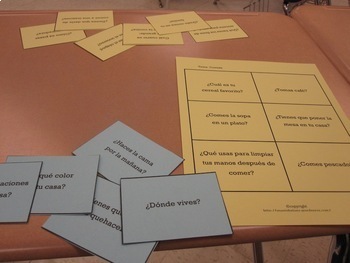 Get your beginning Spanish students talking with these conversation cards in Spanish. Over 300 questions for your students to ask and respond to. 32 pages for Level 1 Cards and 28 pages for Level 2 Cards with 6 "cards" on a page to cut out. This product combines our level 1 and level 2. Buy this combined package and save big. A great lesson to have students orally respond to questions. 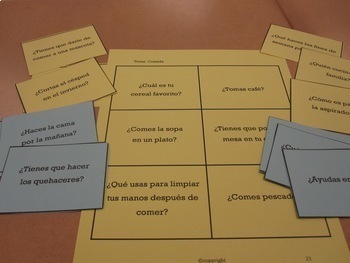 Can be used in pairs, small groups, or as a whole-class activity. Can even be used as review for Spanish 3 class as well. 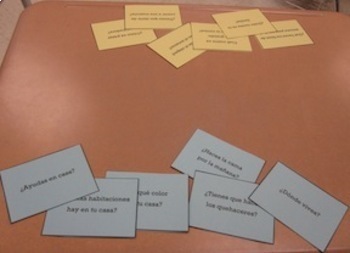 Questions broken down by themes and topics generally covered in early level Spanish classes. Download free preview to see topics and sample cards. 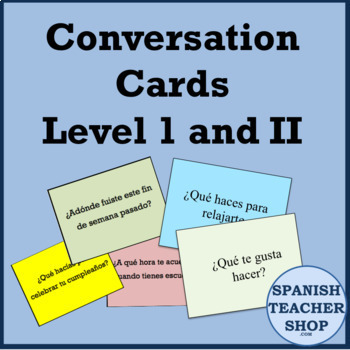 Conversational Cards Levels 1-4 Bundle All our cards! *Look for the green star near the top of the page on the right and "follow me" to find out every time a new product or freebie is added!